Urban designer Don Smith helped create some of the largest and most influential master-planned developments in Southern California, developing a model for suburbia that was imitated around the country. Today, the concept of suburbia is changing, impacting every aspect of the community. In a talk with Catalyst, Don discusses the shifting designs of suburbia and the next generation of millennial suburbanites. What’s the new suburb going to look like? Denser. What we’re seeing in the communities we‘re planning now is that the residential densities are all going up. And we’re seeing much more creative residential homes and products designed to accommodate this density. And that’s driven by land value; the cost of the land. I think in the early days, single-family neighborhoods within a village would probably be about five to the acre, maybe six. Now they’re 10 to 12 units per acre for single-family detached. You think millennials are going to start moving back to the suburbs? Absolutely. I understand cities are exciting. But there’s family realities that come in and that is children, schools, crime. Eventually, as the millennials have children, they end up saying I need one more bedroom and that’s when the change starts to happen. Density is something of a dirty word in many areas. How do you achieve that density in the current environment? In one of the newest villages in Rancho Mission Viejo we’re looking at four-story homes—attached four stories. Now the fourth story is an open deck and there’s a little shelter on top, but it’s going up and up. There’s a new term that’s been coined—“surban.” Surban is suburbia and the urban coming together. How do you create places where people connect in these new communities? A few years back I heard somebody throw a phrase out--there’s home and work and then there’s a third place. You can be home, you can be at work or you can be in your own community, in a place where you’re talking to neighbors. It’s common ground, a sort of safe turf for everybody to come together in the community if they want to and meet. These community spaces are becoming places that give everybody a chance of finding something for themselves in it. But land is at a premium. Does a community center make sense for a developer? In the community where I live you can’t have a pool in your backyard. There’s just no lots big enough. The clubhouse ends up having a substantial swimming pool, Jacuzzis and even have an adult bar. The whole family can be there but operate in separate circles. They’re trying to create this community and this interaction and for you to meet your neighbors and people that live blocks and blocks away. They bring in the food trucks. They bring in music, small bands play. There’s this way of energizing the community through these clubhouses. Does that make economic sense? The buyer first makes a decision on a community. That’s the first thing—they want to be in that community. It’s the community that brings you in. The amenity package in those communities has to be persuasive. 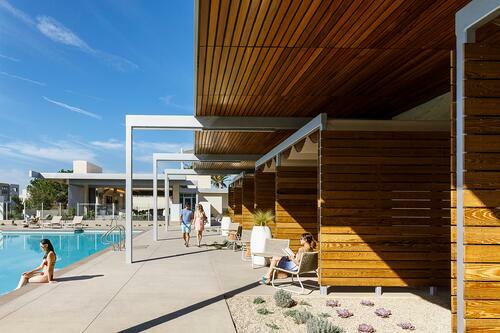 The Orange County Great Park has a wonderful recreation complex called The Pools [an LPA-designed facility that anchors FivePoint's master-planned community on the site of the former Marine Corps Air Station El Toro] and I would suggest you go see it. I went out expecting to see just another community clubhouse. It’s not that at all. You go, “wow.” I would almost buy a house there because of that. What did you like about the facility? The architecture features a lot of light, a lot of light colors like yellows and greens. Nothing dark. Everything was upbeat. And even the architecture. This is a very contemporary looking clubhouse. What amenities do you think are going to be important five years from now? If you can put water into a community, that’s always number one, I think. Water is always there. It’s magic. Usually when I look at property, something I’ve learned years ago is to ask, what’s the big idea here? Each time we look at something I say, what is it we’re going to do that’s going to be the big idea? Preservation of a lot of open space is a big idea. Then within that you have a lot of trails. So I think water and trails are the two simple ones.